With over 34 years of flying experience, our full-time commercial hot air balloon pilots will take you on a safe and memorable adventure in one of our beautiful hot air balloons. 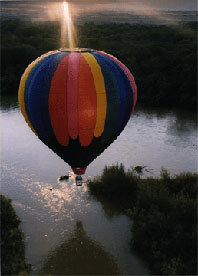 Hot air balloon rides for two (2) passengers and the pilot. Flight duration is approximately 1 hour to 1-1/2 hours flight time. All flights include: balloon flight, a first flight certificate, replica balloon pin and bottle of champagne or non-alcoholic beverages. Our chase crew and pilot will bring you back to the balloon launch site in our chase vehicle after your flight.